Thrift, Sea Thrift, Sea Pink, Cliff Rose. Armeria maritima, our well-known little 'Thrift', which grows so happily on cliffs and seashores is also a very popular garden flower. In the wild it can be found in coastal areas around Europe, growing in dry, sandy, saline conditions such as those at beaches and salt marshes. In our gardens it is known to be one of the easiest grown perennials and a valuable rockery plant. This compact, evergreen perennial grows in low clumps and sends up long stems from which globes of bright pink blooms. Easy to grow, undemanding and very long lived, it is no wonder that our little Thrift has been cultivated worldwide as a garden flower. With clumps of dark green, evergreen foliage it requires little water and very little maintenance once established. Tiny plants only a few inches wide, easily find their way into small niches in your rock garden and low growing borders. A good nectar plant much appreciated by butterflies and moths, Thrift also makes an interesting cut flower and can be dried. 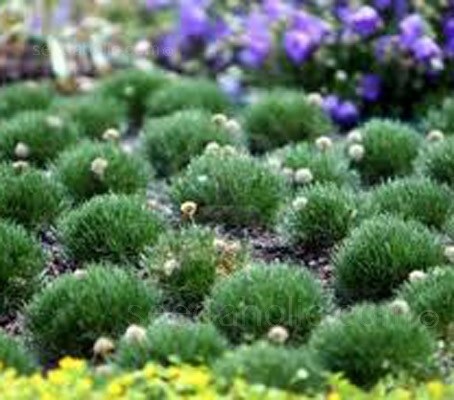 Thrift is an excellent ground cover plant for areas of full sun. It does well on poor soil and is an excellent choice for rocky areas where it can be stuffed into cracks and exist on very little soil. It is perfect for gravel or maritima garden and for gardens designed as xeriscapes or rock gardens. 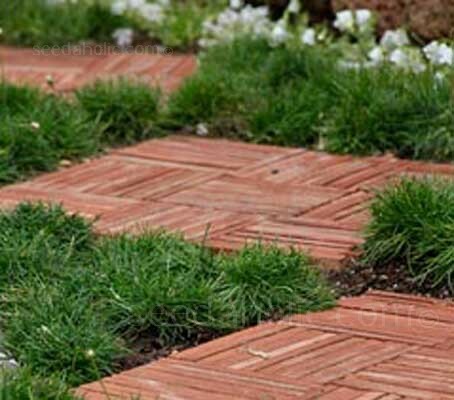 It can take light foot traffic and makes a neat, decorative edge along a garden path or down garden steps. Armeria maritima is an ideal rock garden plant and one that should always be included if choice is restricted. Fill pots with a well drained compost, soak the posts by standing them in water, moistening the compost from the bottom up and then drain. After soaking the seeds sow onto the surface of the compost. Just cover with a very light sprinkling of compost or vermiculite. Place in a propagator or somewhere out of direct sunlight and keep the soil damp but not wet. Seedlings will normally germinate in around two to four weeks but occasionally can be erratic. When seedlings are large enough to handle, transplant and grow them on in cooler conditions until large enough to plant outdoors. Move plants to a coldframe or plunge the pots up to their rims in a sheltered site outdoors, and grow them on in cooler conditions before planting out in the autumn at a distance of 30cm (12in) apart. 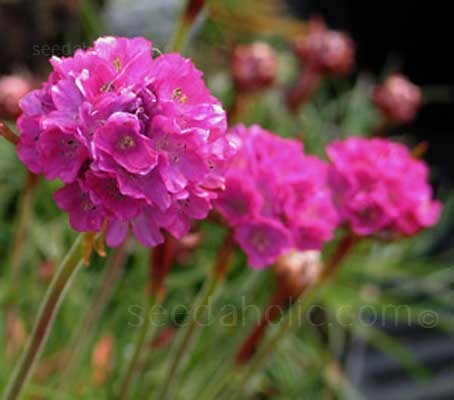 Grow Armeria plants in full sun on well drained soil. 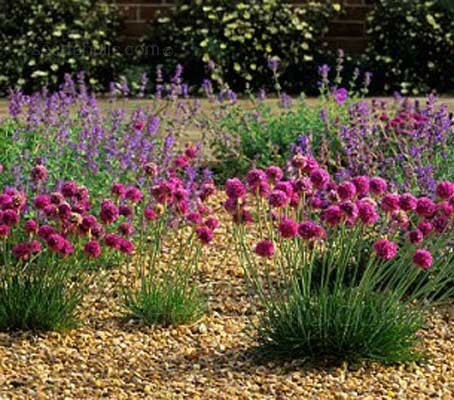 Sea thrift is tolerant of poor sandy soils once established and copes well in coastal areas. On heavier soils, incorporate plenty of grit to improve drainage, prior to planting. It is easy to look after Armeria they require a light watering in dry conditions, Deadhead faded flowers to extend the flowering season throughout the summer. Armeria plants are evergreen, so do not prune them in autumn. Remove dead foliage in spring. Plants can be divided in very early spring. Division is useful to rejuvenate plants that are waning but depending on location may not be necessary some plants can do well for many years just increasing in size. However, if the centers rot out, cut the plants back severely. Divide and replant only healthy plant sections, discarding the rotten centre. Armeria maritima can be found in the wild in coastal areas across the Northern Hemisphere, especially in Europe and North Africa to Turkey and are a common sight in British marshes. They can grow in dry, sandy, saline conditions such as those at beaches and salt marshes. Thrift plants were cultivated in knot gardens during the middle ages and later became standard fare in the English cottage garden. Armeria maritima is a member of the family of flowering plants Plumbaginaceae, sometimes referred to as the leadwort family or the plumbago family. With a cosmopolitan distribution species in this family are found in many different climatic regions, from arctic to tropical conditions, but are particularly associated with salt-rich steppes, marshes, and sea coasts. Carl Ludwig Willdenow (1765-1812) a German botanist, pharmacist, and plant taxonomist assigned the genus. The name Armeria is latinised from the old French name armoires, the common name for a cluster-headed Dianthus, Dianthus armeria. The standard botanical author abbreviation Willd. is applied to plants he described. Interestingly, armeria is also the species name for the genus Dianthus, (Dianthus armeria) which are commonly called 'Pinks' and Armeria maritima are known as ‘Sea Pinks’. The species name, maritima, meaning 'of the Sea' attests to this plant's origin in the maritime coastal regions. The alternative common name of Armeria maritima is 'thrift', although no one can be quite sure why this came about, Richard Mabey, in his Flora Britannica, suggests that it may have been because its tufted leaves were economical with water in the windy locations where it's commonly found. The name 'Splendens' is often used for species and variety names, it is from the Latin splendens, and means ‘shining, glittering, gleaming, glistening, bright or brilliant’. From this we get the word Splendid. Globes of bright pink blooms. Plants 10 to 15cm (4 to 6in), Flowers to 20cm (8in) tall. The sister to “Alba” that has white blooms.